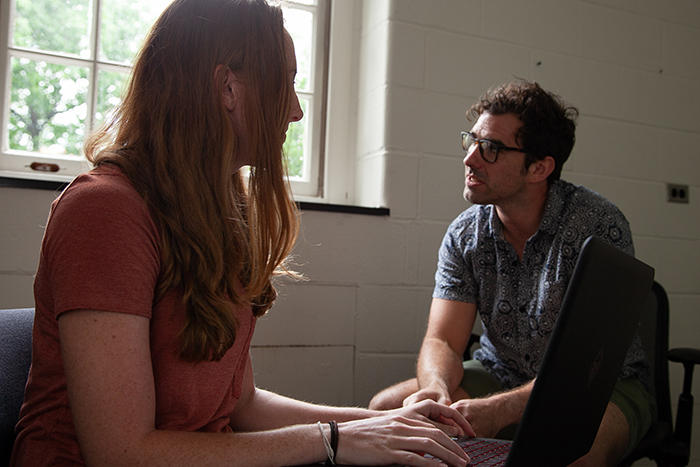 Sarah Campbell '19, a sociology major, paired with Assistant Professor of Philosophy Jeffrey Engelhardt to research the ways that radio personality Rush Limbaugh has helped shape his listeners' perceptions and society and social issues. Photo by Carl Socolow '77. Before Hannity and Fox and Friends, one unmistakable voice boomed loudest across the conservative airwaves. Rush Limbaugh’s eponymous radio program injected a new vocabulary into popular culture when it premiered in 1988 and went on to kick off an opinion-show boom across radio, TV and the internet. Now, as “fake news” dominates national conversation, a student-faculty team trains a critical eye on this founding father of opinion programming and the role he’s played in shaping his fan base’s understanding of society and current events. Assistant Professor of Philosophy Jeff Engelhardt and Sarah Campbell ’19 (sociology) began last summer, researching the ways that Limbaugh engages in “concept doubling” by creating two sets of definitions for social terms, such as racism, sexism and feminism—that’s one definition for each end of the political spectrum—and the potential social effects this could have on his listeners. The team read through 63 transcripts from The Rush Limbaugh Show website, beginning with 19 transcripts in the days surrounding the 2016 U.S. presidential election. Engelhardt and Campbell published their findings—the first installment in a planned series of studies by Engelhardt—in the March 2018 issue of Journal of Applied Philosophy, and Engelhardt secured a second research grant to continue the work this summer. Campbell, who’d grown even more interested in the topic last fall, while taking a course on language and racial inequality as a study-abroad student in Australia, happily signed up. The student-faculty team is currently focusing on semantic deference, or the ways in which the Limbaugh knowledge community defers to Limbaugh’s views. They plan to publish their findings shortly. Engelhardt also is working on a book on language and power. He says he enjoyed working with Campbell, whom he’d recognized as an outstanding student after having her in two philosophy classes. And Campbell says the chance to develop hypotheses with a professor helped sharpen her critical-thinking skills and writing ability, which will come in handy as she prepares to pursue a Ph.D. in sociology after graduation. The project is one of many student-faculty projects under way at Dickinson not just during the academic year, but also during the summer months; these range from scientific experiments to studies in the humanities to arts projects and performances.